* Close Approach (CA) Distance is the distance between the Earth center and asteroid center. Diameter estimates based on the object's absolute magnitude . "Comet Lemmon has a beautiful tail with lovely fine structure," says Phil Hart of Lake Eppalock, Victoria, Australia, who photographed it on Feb. 17th. The comet is now slightly closer to the sun than Earth. Solar heating has turned it into a binocular object (magnitude +5.5 to +6) barely visible to the human eye, but dazzling through backyard telescopes, as shown in Hart's photo on the left. 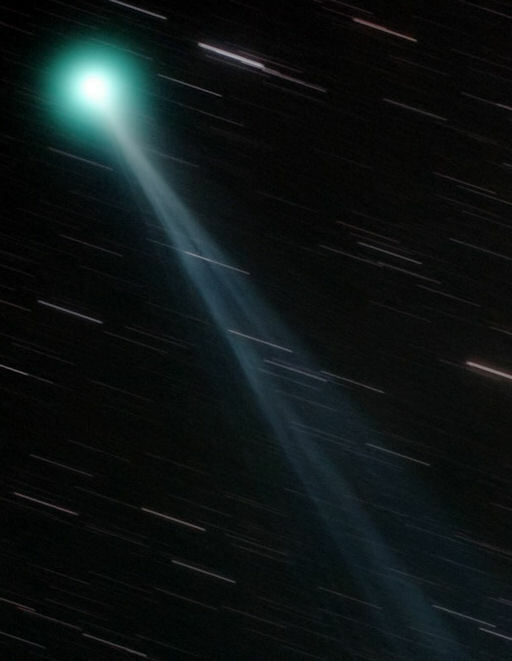 Comet Lemmon's verdant color comes from two of the gases boiling off its nucleus: cyanogen (CN: a poisonous gas found in many comets) and diatomic carbon (C 2 ). Both substances glow green when illuminated by sunlight in the near-vacuum of space. The combination of its colorful atmosphere and filamentary tail make this comet visually striking. Ultimately, Comet Pan-STARRS and especially Comet ISON could surpass it, but for now the most beautiful comet in the solar system appears to be a green Lemmon. More about Comet Lemmon: 3D orbit , ephemeris , light curves . On Feb. 15th 2013 an asteroid about half the size of a football field will fly past Earth closer than many man-made satellites. Since regular sky surveys began in the 1990s, astronomers have never seen an object so big come so close to our planet. Event into space in Russia [Asia] on Friday, 15 February, 2013 at 06:20 (06:20 AM) UTC. Russian officials say a meteorite has fallen in the Chelyabinsk region some 1,500 kilometers (930 miles) east of Moscow. A spokesman for the Russian Interior Ministry, Vadim Kolesnikov, said the Friday morning fall caused a blast that broke windows. There were no immediate confirmed reports of injuries, but Russian news agencies cited unnamed sources as saying several people were injured at a school in a thinly populated part of the region, which is on the eastern edge of the Ural Mountains.